Arrigoni, a leading international player in the technical textile sector for agriculture, was among the key players of the 2019 edition of the Global Berry Congress, held from 25 to 27 March in Rotterdam. With a speech given by Milena Poledica, agronomist and researcher of the Group, invited for the occasion to this exclusive event, the Company presented its innovative “100% green” solutions to protect berry fruits from atmospheric events and harmful insects. “Berry fruits production – Poledica said – knows no crisis, thanks to the increasing interest that these super foods arouse among consumers all over the world. A figure, above all, can help to understand the current trend: while in 2017 13.4 million tons of berries (berries and strawberries) were collected in the world, in 2020, 15.4 million tons are expected (source: Ncx Drahorad). Specifically, over 70% of the world’s berry fruit production is made up of strawberries, but the production of blueberries, raspberries and blackberries is also growing. In 2020, 2 million tons of blueberries will be collected, compared to 1.7 million tons in 2017. The volume of raspberries and blackberries will increase from 1.3 million tons in 2017 to 1.4 million tons in 2020. However – continues Poledica – as with other high-value crops, growing berries leads to a high level of risk because these are very sensitive crops to environmental conditions. The producers of blueberries, strawberries, raspberries are constantly looking for ways to reduce the environmental impact and respond to the growing needs of the market and the selective needs of consumers. This is the context in which Arrigoni is committed to helping berry growers around the world improve quality, sustainability and ensure the production of blueberries, strawberries, raspberries and other berries”. First of all, Robuxta® Mdf White reproduces the ideal conditions for growing strawberries, blueberries and raspberries. The advantages that this solution ensures are many and can be summarized in a series of key concepts: high mechanical strength, better distribution of light around the plants; better performance of homogeneous development and health of plants thanks to the white color (less losses and greater irradiation useful for the photosynthesis); it guarantees the right amount of light satisfying needs of different plants; a fresher environment and more favorable conditions for plant development, thanks to the white color; less damage due to direct radiation thanks to the diffusion and reflection of infrared rays. The advantages of the Robuxta® Mdf White solution, illustrated by Poledica on the occasion of the congress, were also measured in the field, thanks to two different experiments conducted in Southern Italy and South Africa. “In Italy, – explained the researcher – the field tests have shown, for raspberry protected with Robuxta® Mdf White, an increase in productivity up to 41.34%. Quality has also improved: 63.4% of the fruits proved to be ideal in terms of size and color, with second-choice fruits reduced to 36.6%, compared to 45 or 55% in the case of traditional protection systems. Thanks to an optimal level of shading (46%), the conditions of the undergrowth are reproduced in fact, with lower temperatures of 4 – 5 degrees even in the hottest months, which helps both the development of the plants and employees’ work. Another very successful field trial – she continued – was done in a blueberry nursery in South Africa, in this case with Robuxta® Ldf White, low density factor thermo-reflective screen. In this case, with an outdoor temperature of 34 °, in the leaf area the recorded temperature was 28 °. Equally important, in the chemical composition of the tape of Robuxta® Mdf White and Ldf White screens Arrigoni added an additive, the exclusive LD – Light Diffusion, which increases the diffusion of light; as it is part of the net, its selective power does not change over time”. Similar advantages, in terms of LD additive and thermo-reflective properties, can also be found with Arrigoni’s Prisma® screens. Made of high tenacity polyethylene monofilament, Biorete® Air Plus screens are the effective barrier against insects that damage berry fruits. These innovative insect screens prevent the harmful insects reach the crops and cause damage, while at the same time increase air passage inside. The insect protection system consequently reduces the need for pesticides, with solutions that manage to counter the attacks of Drosophila Suzukii and other insects. Finally, in rainy areas, Arrigoni’s solution is Protecta®, a very dense mesh fabric that protects crops from rain but allows adequate air passage. Properly inclined, it reduces the passage of rain by 90% but, at the same time, allows a sufficient air ventilation, allowing the preservation of a good internal microclimate and protection from wind, frost, sun and hail. 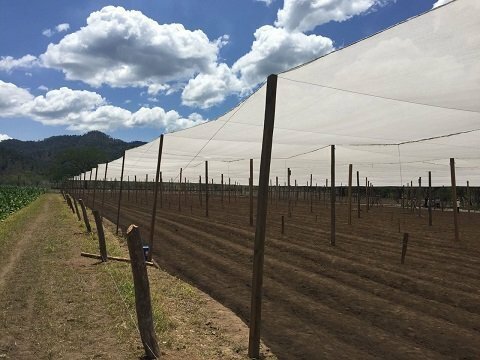 The horizontal covering rainproof fabric can be integrated with the side protection provided by Biorete® screens, effective in preventing insects from coming into contact with the plants and causing damage in fruit-growing. Fructus® anti-hail nets and Arricover® bioclimatic screens complete Arrigoni proposals for berry fruits. The latter, in particular, have been designed for open field use and, in a single solution, improve the microclimate and protect against frost, insects and light hail.